Celestion speakers are revered worldwide for their signature midrange presence and growling cone break-up. We like to think that our speakers and the Celestion signature sound are considered to be one of the most important elements of great guitar tone. The Celestion Neo 250 Copperback speaker, on the other hand, was designed with a different tonal flavour in mind. The Copperback is more tonally transparent than other Celestion guitar speakers, and through this, reveals the sonic characteristics and detailed nuances of your amp and guitar playing without introducing a great deal of additional colouration that’s often generated by cone break-up. If you’re after that classic Celestion ‘brown sound’, the Neo 250 Copperback may not be for you, but this impulse response’s unique characteristics deliver a satisfying combination of tight lows, neutral low-mids, open upper-mid definition and well-controlled high treble. It gives you the ultimate control over your guitar tone: from shimmering, bell-like tones to almost flute-like high gain, with simply a tweak of the amplifier’s drive setting. The design of the Copperback combines elements taken from Celestion classic guitar speakers which imbue superb musicality. To this is added key characteristics from Celestion’s range of professional audio speakers, such as a treated cambric surround, composite voice coil former, curved cone profile and a large paper dust cap that together enable the speaker to deliver superb transparency and evenness of response. Now for the first time, the unique and innovative Copperback has been faithfully captured in digital form as a speaker impulse response. Recorded by our expert sound engineers using the same meticulous techniques as all our best-selling IRs, the Neo 250 Copperback speaker impulse response was captured with three pro-quality studio microphones – the classic Shure SM57, a Royer R-121 ribbon mic and a Sennheiser MD421. Each of these mics were recorded in six different positions – named within the impulse response files as Balanced, Bright, fat, Thin, Dark and Dark 2 – as well as a rear mic position for the open back cabs. The addition of a Neumann TLM107 room mic provides the user with a huge number of different mic mixes and range of unique tonal options. As with all our other guitar speaker impulses, the Celestion Neo 250 Copperback IR is downloaded in .WAV format ensuring full compatibility with the majority of DAWs, IR plugins and amp modelling software. 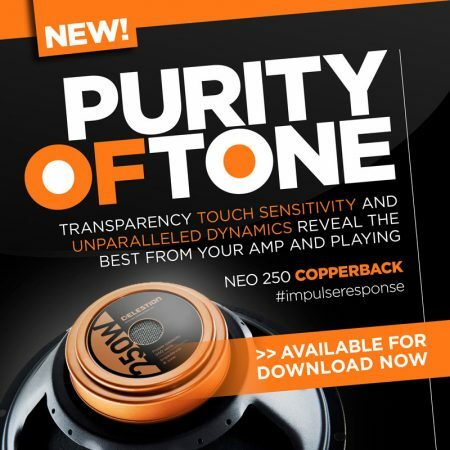 Create tons of tone and sound your truest by downloading the Celestion Neo 250 Copperback impulse response today!